Contact us when you are serious about buying or selling a fine AJS Motorcycle. The A.J. Stevens & Co. Ltd. was founded in 1909 by four brothers - George, Harry, Jack and Joe Stevens, of Wolverhampton, England. The Stevens brothers began by working at the Stevens Screw Company, started by their father Joseph Stevens in the late 1800s. Joe senior built small 125cc Wearwell-Stevens motorcycle engines through around 1905. His sons began building their own motorcycles using J.A. Prestwichs J.A.P. 4-stroke engines and two-stroke motors supplied by Charles Marston's Villiers Engineering Co. Ltd. in Wolverhampton. AJS built its first production motorcycle in 1911, using their own proprietary single-cylinder 292cc side-valve motor which produced 2.75 bhp. By 1912, AJS introduced its first V-Twin powered 698cc three-speed , which produced 6 hp. After several victories at the Junior TT, AJS was receiving more orders than it could fill, so the company built a new factory at Graiseley Hill and Penn Road in Wolverhampton. In 1920, AJS purchased Sir Charles William Hayward's sidecar manufacturing business. Hayward had previously been building sidecars for rival Sunbeam. Throughout the 1920s, AJS produced several successful models, from the 349cc single-cylinder - Big Port - launched in 1923, to the 349cc model K7 in the late 1920s. The K7 was a racing version with a chain-driven OHC engine. These were followed by the 498cc OHC model K10 and M10. Matchless Purchases AJS In the early 1920s, AJS decided to dabbled in automobile, and bus manufacturing, but sales never reached expectations, and the company's fortunes declined. In 1931, AJS introduced its last motorcycle under the A.J. Stevens & Company banner, which was a shaft-driven 496cc V-Twin called the S3. These ventures were ultimately unsuccessful, and in 1931 AJS ceased operations, declaring bankruptcy. The AJS name and motorcycle assets were purchased by Collier & Sons, owners of the Matchless Motor Cycles company, and the AJS car division was sold to Crossley Motors in Manchester. The AJS name was worth continuing, due to their many accumulated world records, but the AJS Graiseley Hill Works was sold to the Star Aluminium Company Ltd. and the Wolverhampton Die Castings Company shortly after AJS sale to Matchless. In 1937, Charlie and Harry Collier changed the Matchless company name to Amalgamated Motor Cycles Ltd. and changed it again in 1938, forming Associated Motor Cycles AMC. Associated Motor Cycles and Matchless continued to build motorcycles under the AJS name through the 1960s. In an effort to create something unique, that would properly utilize the AJS name, Collier & Sons launched the Vee 4 touring bike in 1935. Designed by Bert Collier, the Vee 4 had a unique, and technologically advanced 500cc chain-driven SOHC engine, with exposed hairpin valve springs. The AJS Vee 4 was an offshoot of another v-four Collier engine design the 1931 593cc Matchless Silver Hawk. By 1936, AJS introduced a racing version of the Vee 4, using a supercharger designed by Swiss engineer Arnold Zoller. The supercharged V4 produced 55 bhp, and had a top speed of 205 km/h, and was designed to compete against BMW's supercharged racers. Between 1936 and 1939, the AJS Vee 4 set several records, breaking the 160 km/h lap speed record at the Ulster Grand Prix. During the last model year for the Vee 4 in 1939, a liquid-cooled cast alloy engine was produced, using enclosed valve springs. The followup to the V4 was the AJS Porcupine, which was a supercharged 500 cc parallel-twin, but when the International Motorcycling Federation's new racing regulations banned the use of forced induction engine modifications in 1946, the supercharged Porcupine was discontinued. Throughout the 1940s and 1950s, AJS built several notable racers, from the 350cc 7R Jr. Racer and Boy Racer, to the 1951 7R3, using three valves per cylinder. 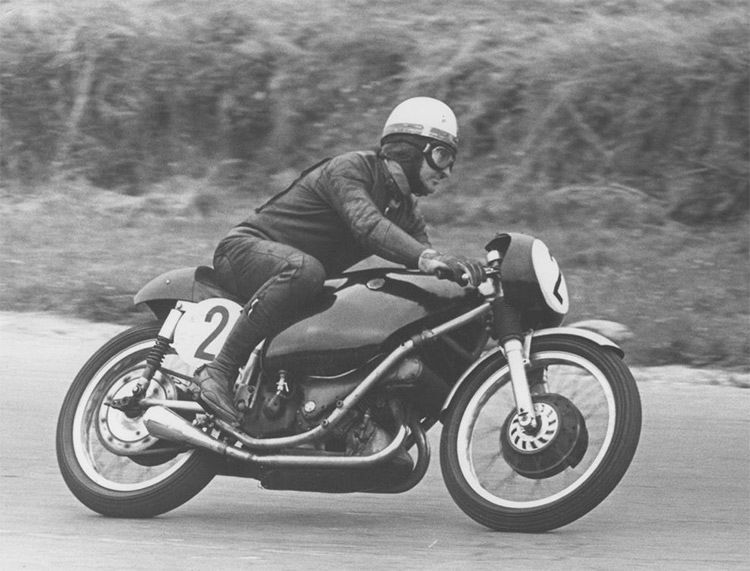 The AJS 7R was virtually identical to the 500cc Matchless G50. The 7R was discontinued in 1963. 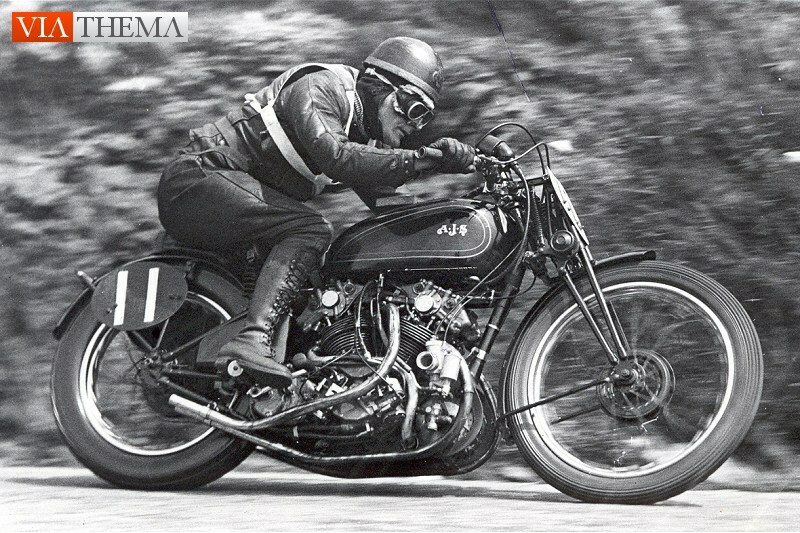 AJS went on to build several road bikes, such as the 750cc AJS Model 33 and 2-stroke off-road dirt bikes such as the 250 and 410 Stormer and MX motocross bike. Matchless, under AMC continued to build motorcycles under the AJS name through the 1960s. In 1966, AMC was sold to Norton-Villiers parent company, Manganese Bronze Holdings PLC of Coventry, England. By 1974, Norton-Villers also reached the end of its financial rope, and a bailout from the British government formed Norton-Villiers-Triumph from the failed companies. NVT was also short-lived, going into receivership in late 1974.